Alexey Balabanov’s classic film is a vehicle that provides insight into an area of our world that is once again in turmoil. A must have film for any collection of international cinema, CARGO 200 provides a political perspective well worth revisiting. The critics unanimously acknowledge CARGO 200 as one of the most significant films to come out of Russia, and many consider it Russian director Alexey Balabanov’s (Brother, Of Freaks And Men) best film. 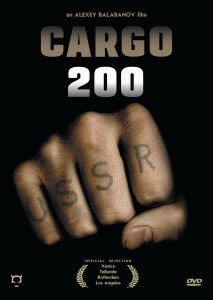 A gritty thriller based on actual events, CARGO 200 is set in 1984 provincial Russia, where the gloom of Soviet life has reached extreme depths. Balabanov presents an unremittingly dark and unflinching portrait of the decline of the Soviet era. The title refers to the Soviet term for military corpses returning from Afghanistan. Guaranteed to shock even the most strong-stomached of viewers, CARGO 200 is one of the most controversial movies ever to emerge from Russia.